Detection of Human B7-2/CD86 by Western Blot. Western blot shows lysates of Daudi human Burkitt's lymphoma cell line. 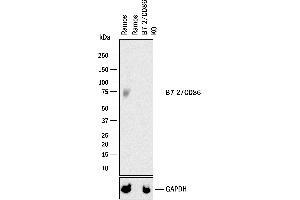 PVDF membrane was probed with 5 ug/mL of Mouse Anti-Human B7-2/CD86 Monoclonal Antibody. This experiment was conducted under reducing conditions. 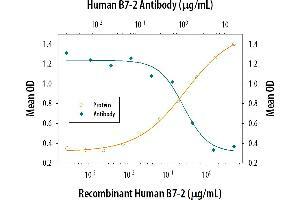 Cell IL-2 Secretion Induced by B7-2/CD86 and Neutralization by Human B7-2/CD86 Antibody. 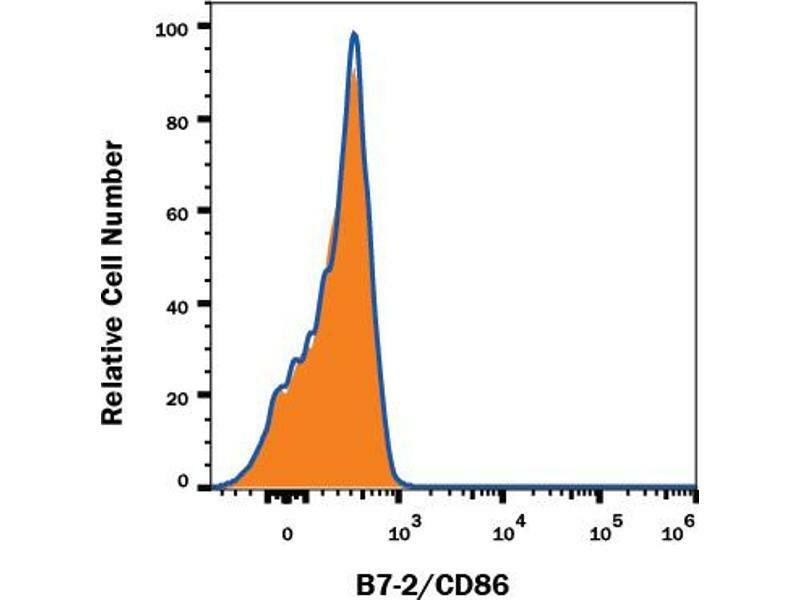 Recombinant Human B7-2/CD86 Fc Chimera induces IL-2 secretion in the Jurkat human acute T cell leukemia cell line in a dose-dependent manner (orange line), as measured by the Human IL-2 Quantikine kit. The ND50 is typically 0.5-2.5 ug/mL. 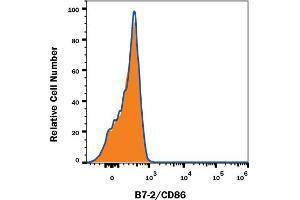 Detection of B7-2/CD86 in Human Blood Monocytes by Flow Cytometry. 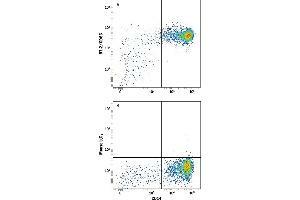 Human peripheral blood monocytes were stained with Mouse Anti-Human CD14 PE-conjugated Monoclonal Antibody. 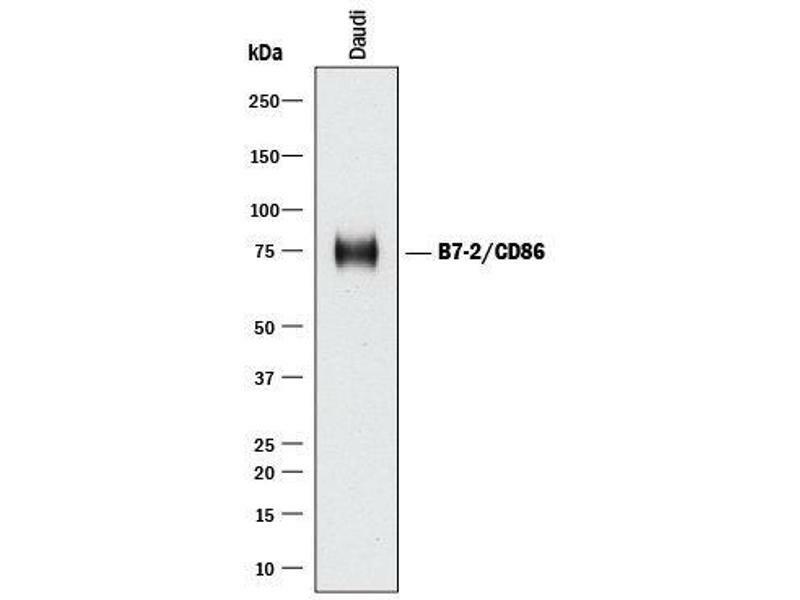 Western Blot Shows Human B7-2/CD86 Specificity by Using Knockout Cell Line. Western blot shows lysates of Ramos human Burkitt's lymphoma parental cell line and B7-2/CD86 knockout Ramos cell line (KO). PVDF membrane was probed with 5 ug/mL of Mouse Anti-Human B7-2/CD86 Monoclonal Antibody is shown as a loading control. This experiment was conducted under reducing conditions. 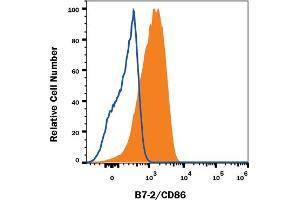 B7-2/CD86 Specificity is Shown by Flow Cytometry in Knockout Cell Line. 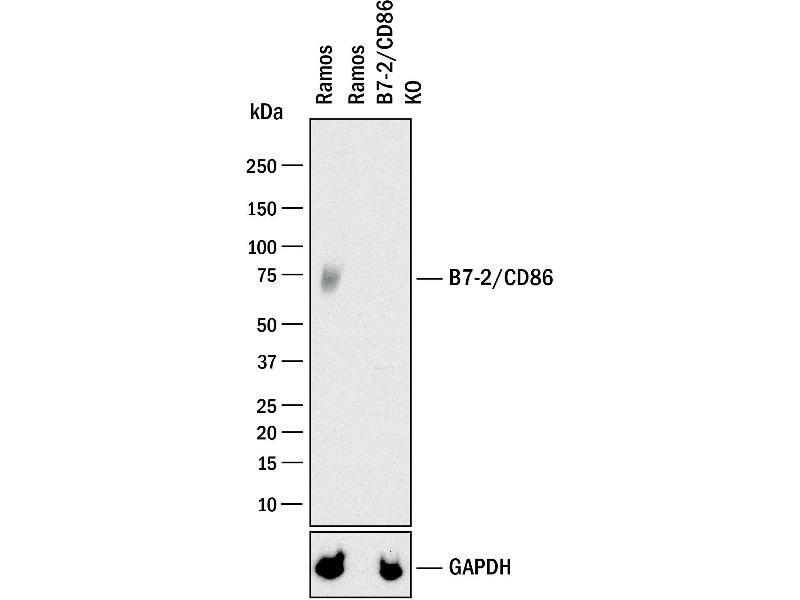 B7-2/CD86 knockout Ramos human lymphoma cell line was stained with Mouse Anti-Human B7-2/CD86 Monoclonal Antibody. 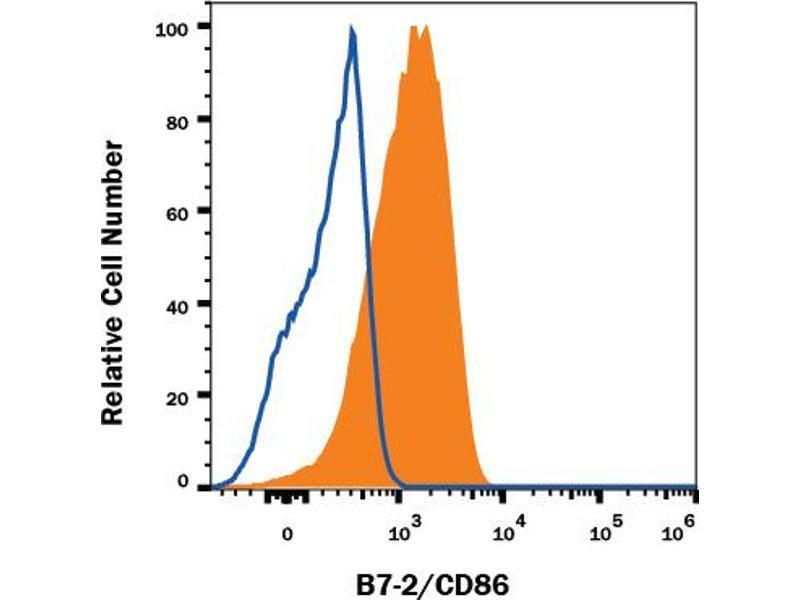 No staining in the B7-2/CD86 knockout Ramos cell line was observed. 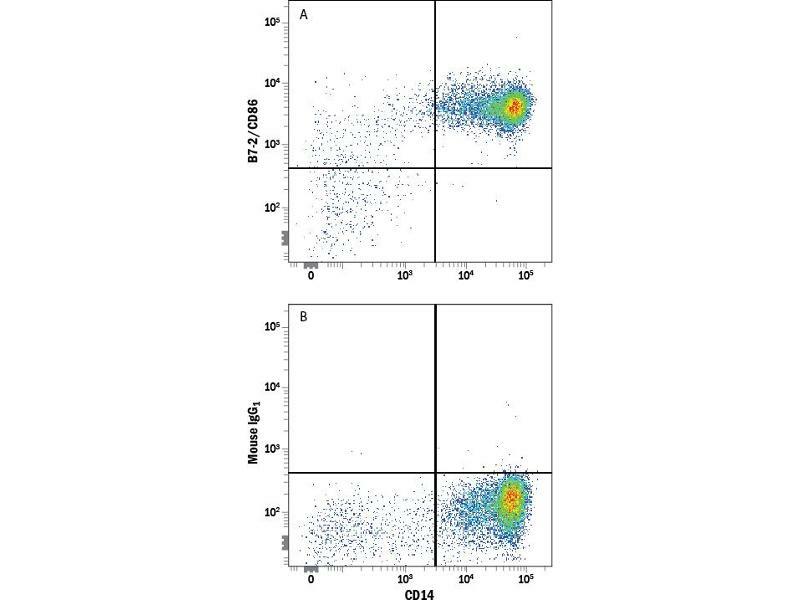 Detection of B7-2/CD86 in Human Ramos Cell Line by Flow Cytometry. Human Ramos lymphoma cell line was stained with Mouse Anti-Human B7 Formatting the figure legends (adjusted HTML for better line wrapping). Only applies to the website insert. 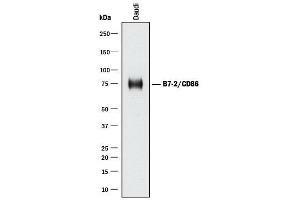 2/CD86 Monoclonal Antibody. Specificity Detects human B7-2/CD86 in direct ELISAs and Western blots. 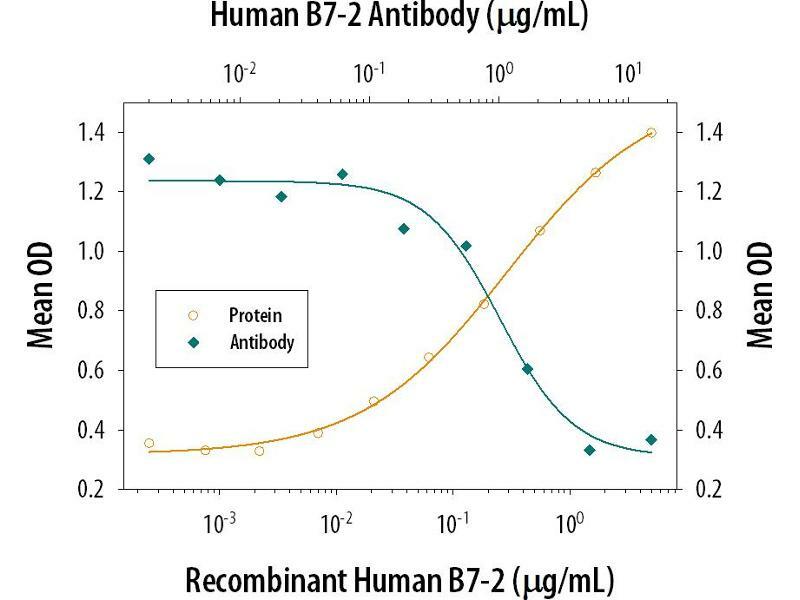 In direct ELISAs, no cross-reactivity with recombinant human (rh) B7-1, recombinant mouse B7-2, recombinant rat B7-2, rhB7-H1, rhB7-H2, rhB7-H3, rhB7-H3b, rhB7-H4, or rhB7-L2 is observed. Cavel, Shomron, Shabtay, Vital, Trejo-Leider, Weizman, Krelin, Fong, Wong, Amit, Gil: "Endoneurial macrophages induce perineural invasion of pancreatic cancer cells by secretion of GDNF and activation of RET tyrosine kinase receptor." in: Cancer research, Vol. 72, Issue 22, pp. 5733-43, 2012 Method employed by authors: Immunocytochemistry (ICC) (Sample species: Human). Weissmüller, Semmler, Kalinke, Christians, Müller-Berghaus, Waibler: "ICOS-LICOS interaction is critically involved in TGN1412-mediated T-cell activation." in: Blood, Vol. 119, Issue 26, pp. 6268-77, 2012 Method employed by authors: Neutralization (Neut) (Sample species: Human). El Fakhry, Alturaihi, Diallo, Merhi, Mourad: "Critical role of lipid rafts in CD154-mediated T cell signaling." in: European journal of immunology, Vol. 40, Issue 3, pp. 770-9, 2010 Method employed by authors: Flow Cytometry (FACS) (Sample species: Human). Tso, Law, Tu, Chan, Lau: "Phagocytosis of apoptotic cells modulates mesenchymal stem cells osteogenic differentiation to enhance IL-17 and RANKL expression on CD4+ T cells." in: Stem cells (Dayton, Ohio), Vol. 28, Issue 5, pp. 939-54, 2010 Method employed by authors: Neutralization (Neut) (Sample species: Human). van der Vliet, Wang, Yue, Koon, Balk, Exley: "Circulating myeloid dendritic cells of advanced cancer patients result in reduced activation and a biased cytokine profile in invariant NKT cells." in: Journal of immunology (Baltimore, Md. : 1950), Vol. 180, Issue 11, pp. 7287-93, 2008 Method employed by authors: Neutralization (Neut) (Sample species: Human). Sakthivel, Shively, Kakoulidou, Pearce, Lefvert: "The soluble forms of CD28, CD86 and CTLA-4 constitute possible immunological markers in patients with abdominal aortic aneurysm." in: Journal of internal medicine, Vol. 261, Issue 4, pp. 399-407, 2007 Method employed by authors: ELISA (ELISA) (Sample species: Human). Hock, Patton, Budhia, Mannari, Roberts, McKenzie: "Human plasma contains a soluble form of CD86 which is present at elevated levels in some leukaemia patients." in: Leukemia, Vol. 16, Issue 5, pp. 865-73, 2002 Method employed by authors: ELISA (ELISA) (Sample species: Human).